Peridot, Amethyst, Citrine, Rhodolite Garnet, Swiss Blue Topaz. Peridot, Amethyst, Citrine, Rhodolite Garnet and Swiss Blue Topaz also available. 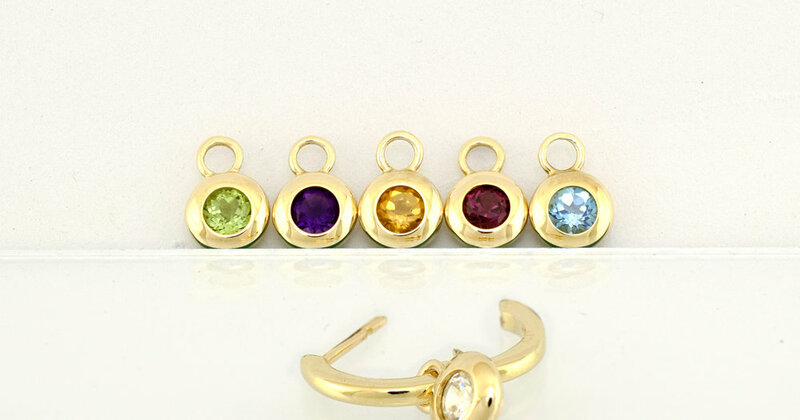 $90 Drop pair only (no hoop) in 9ct yellow gold set with any of the gemstones listed above. In stock. The clip hoops can be purchased separately and pricing and details are here. Buy one pair of clip hoops and then the pods separately to swap as you desire.